This is not a typical post for me, but I need to share an incredible deal on sound synthesis software. For this weekend only (until November 30) you can buy each of the Native Instruments synths for €99 ($99 for 'Mericans). As a registered owner I got this offer in my email but didn't notice it until today. Absynth, Massive and FM8 are all highly regarded soft synths, but the real deal is on Reaktor 5, a complete modular synthesis package that comes with hundreds of different instruments and gives you access to thousands more. At this price it's 75% off retail! Limerick hasn't seen a Mamuska Night for about a year. People miss the regular appearance of this no-holds-barred performance evening. In the past I've taken different approaches to the sound environment, depending on the night. Sometimes I've produced original music in an electro vein and other times have filled more of a conventional DJ role. It is a tricky act since essentially I am filling in between performances that might have their own music, none of which I know beforehand. I don't want to detract from the performances or even try to compete with them. Having worked closely with Davide Terlingo, the creator of Mamuska, I understand the ethos. Too much "party music" spoils the special mood and takes it into a different orbit. The idea is not to blast dance tunes but to create a social environment in which people can mix and mingle. Curator Angie Smalis was totally in agreement with that; she gave me scope to do as I liked. 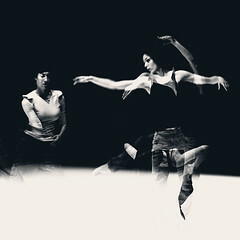 As a supplement to Gravity And Grace: Six Evenings of Dance, there is a "celebration and christening" of the two Daghdha books: Book of Recommendations and Choreography as an Aesthetics of Change. Join us this evening (Saturday 21 November) at 6.30pm in Daghdha Space, John’s Square, Limerick. The former book is a concise manifesto, written by Michael Klien, Steve Valk and Jeffrey Gormly to describe the underlying ideas of the Framemakers Series of symposia and other events in the Daghdha constellation. The latter is an anthology, edited by Gormly, of 31 essays by a wide variety of thinkers and practitioners. Choreography is a core concept, but only as a jumping off point for discussions of ecology, communications, film, social networks, activism and much more. It's an excellent volume -- and not only because I have a paper included! If you're interested in contemporary choreography, dance music, strange happenings or just having a wicked time you'll want to check out Gravity And Grace this week. 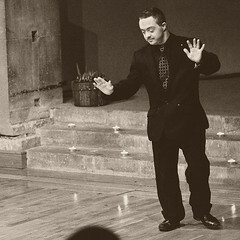 These six evenings are presented by Daghdha Dance Company in their lovely restored church in John's Square, Limerick. 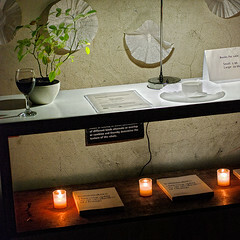 The first night was tonight but you haven't missed anything yet, as Michael Klien's "Standing In Ink" repeats tomorrow. Check out the full schedule on their website or read on for highlights of what I am helping out with. This series of articles is for people who wish to record sounds from their environment: nature recordists, phonographers and field recordists. In the first installment I summarised the core characteristics of 21 portable digital audio recorders, dividing the units into three categories based on their form factor: Pocket, Hand and Shoulder. In the second article I added a dozen features to the comparison table, so I could recommend which models were worthy of purchase. I assumed for that evaluation that you'd want a recorder small enough to take with you at all times, so you never miss a sound in the field. For that reason, the last article assumed the use of the relatively mediocre built-in microphones provided by compact recorders. They are certainly convenient, but for optimum audio quality one can do much better by using external low-noise microphones. That is the approach I will take in this article. 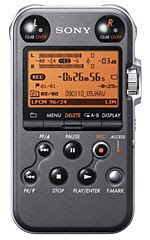 Which Portable Digital Audio Recorder? In this article I'll continue from my Summary of Portable Digital Audio Recorders. Specifically I'll consider those that work well for gathering environmental and nature sounds. Last time I collated information and provided a general overview of the field. Today I'll be making specific recommendations. How to begin to compare 21 different recorders? Let's start with the assumption that you want to have an audio recorder on hand always. If you don't have one with you, you'll miss that intriguing sound when it happens. Thus the device needs to be small enough to fit in a pocket and add little to your daily load. That eliminates from consideration the Shoulder units, which work best with external microphones and a backpack full of gear. A more extensive setup has its place, but I recommend that first-time buyers get something easier to use. A hand-held recorder will get you started in field recording and will still be useful once you have a full rig. N.B. This is only one way to start narrowing down the list of recorders. In my next article I'll consider a different perspective. As a sound artist and composer I make field recordings an integral part of my artistic practice. I capture sounds in their native habitat and bring them back to the studio to use them as components in new sound pieces. 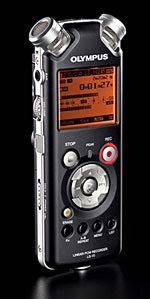 Once upon a time it was difficult to find a decent digital field recorder for an affordable price. Now everyone and their uncle seems to be releasing portable flash recorders. The problem now is trying to decide which of the plethora of devices is most suitable. In this article I will summarise several years of reading and careful specification comparison, not to mention actual practice in the field. A pattern has emerged in the available products, which I will illustrate by comparing twenty different recorder models. I hope this will help you to make an informed purchase decision, which I will assist with further in part two of this series.